Oh hello empties ! When I saw the bag overfloating under my dressing table, I decided it was time. 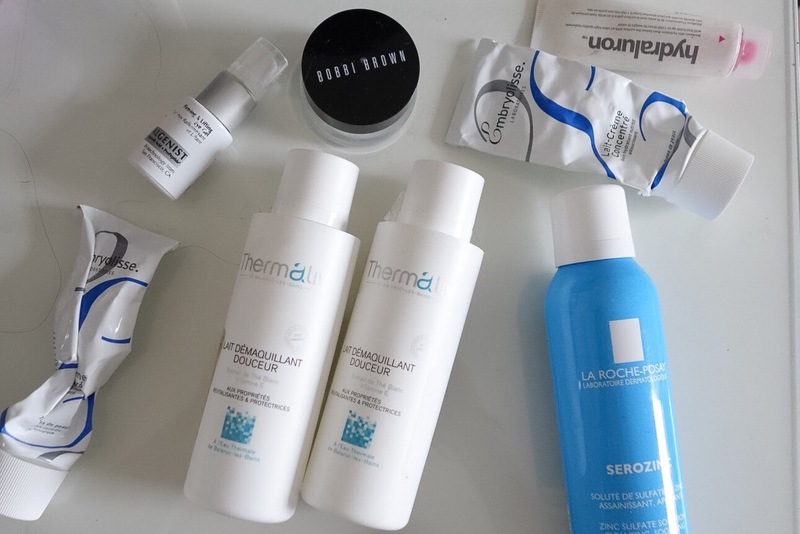 here are my empties and a little review of the products as we go. The Nars Creamy Concealer in Custard: My daily go to concealer, I’ve through at least 4 tubes of it. This tube lasted a lot longer since I used the trick linked up there. Bobbi Brown Eye Brightener in Bisque: my undereye corrector of choice. It is moisturizing and so effective in brightening the undereye area. The Smashbox high definition liquid concealer in Medium: when my skin gets darker in summer, that is my go to shade. The consistency is so light and easy to blend that it is perfect for long summer day when you don’t want to feel make-up on your skin. When this shade gets too golden for my skin, I know the summer is over. I will surely repurchase it in time for next summer. The Essence eyeliner pen in Waterproof (presented here) I bought this one mainly because it was cheap and it was a good way to be introduced to liquid liner without breaking the bank. Essence is one of my favourite brand of makeup about there but this just did not work for me. It transfers and is not as black as I would like it to be. 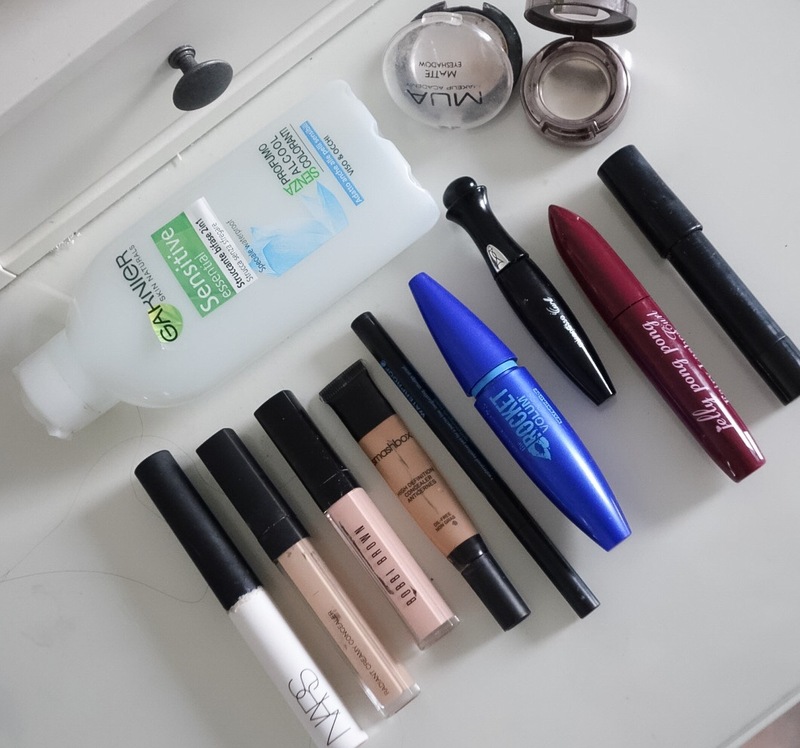 Onto the Mascaras – Maybelline the rocket volume express in Waterproof is my go to mascara – I have no jokes around 10 back-ups of them in stock in my draws. I buy them in bulk when they are on offer and use them all year round – When you pay 3 euros for a mascara you don’t mind having to throw it out every 6 months. The Jelly Pong Pong Fairy Lashes Mascara Curl: I did not get along with the consistency of this mascara, and when it is not waterproof, it is a NO from me, especially in summer. MUA single Matte Shadow in Fudge: It’s the second one I finish – as I say here I use this shade to transition my shadow to give it a more blended, natural look. I simply cannot go a makeup day without using this. The Garnier Sensitive eye makeup remover and Garnier skin natural 2 in 1 makeup remover: both are excellent and remove the eye makeup very well ! Embryolisse Lait Crème Concentré : My go-to moisturizer perfect for every skin types. It made my skin feel so soft, Can’t stop using it ! Thermaliv Make-up removing milk : enriched with E vitamin and white tea, this product made me use a milk again. Remove make-up very well and moisturize the skin in one go. It has no perfume to it. It is such a nice night time ritual before I cleanse my face. The Algenist Firming & lifting eye gel and I just did not get along. I had an horrible reaction to this product. I won’t be finishing it. I like the Algenist face mask, so I was very surprise that I did not get along with this. 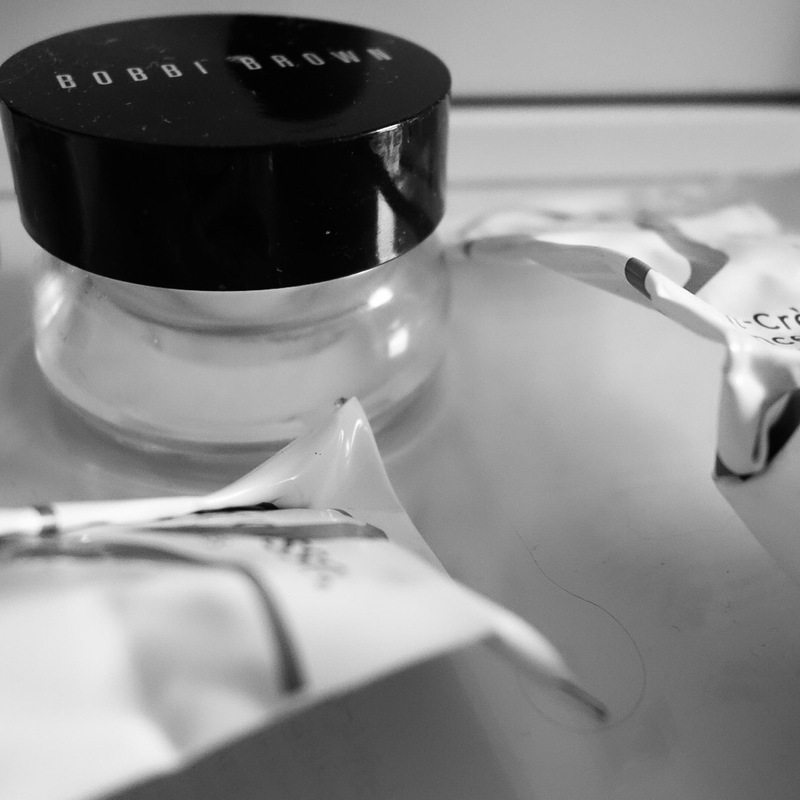 The Bobbi Brown Extra Eye Repair Cream: though it is an expensive eye-cream, I raved about this for ages. This is my fifth tub of it and I just cannot get enough of it. So moisturizing and the SPF of 25 is a life-saver – works wonders on dark circles. Indeed Laboratory Hydraluron is supposed to be a product everyone loves, I had my phase of loving it but other phases when I feel like it makes my make-up on top peel. It is supposed to help the skin hold 1000 times its weight in water. I dunno, I was not amazed by this. La Roche Posay Serozinc is a zinc sulfate solution for cleansing and soothing the skin. I love this spray I feel like it helps so much to clear acne. I spray this after cleansing my skin before applying moisturising. A good drugstore spray. sorry for the long post ! Part 2 will be up in a week or so !